While there is no "perfect" solution or absolute zero risk, engineering design can significantly reduce risk potential in the CPI. 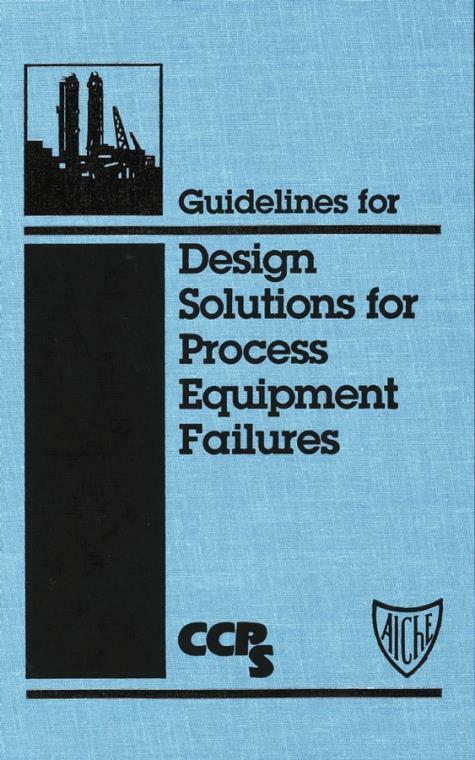 In Guidelines for Design Solutions to Process Equipment Failures, industry experts offer their broad experience in identifying numerous solutions to the more common process equipment failures including inherent safer/passive, active, and procedural solutions, in decreasing order of robustness and reliability. The book challenges the engineer to identify opportunities for inherent and passive safety features early, and use a risk–based approach to process safety systems specification. The book is organized into three basic sections: 1) a technique for making risk–based design decisions; 2) potential failure scenarios for 10 major processing equipment categories; and 3) two worked examples showing how the techniques can be applied. The equipment categories covered are: vessels, reactors, mass transfer equipment, fluid transfer equipment, solids–fluid separators, solids handling and processing equipment, and piping and piping components. Special Details: Hardcover book plus 3.5" diskette for use in any word processing program with design solutions for use in PHAs. 1.5 Organization of This Book. 2. Technique for Selecting the Design Bases for Process Safety Systems. 2.2 The Concept of Risk. 2.3 Selection of Design Bases for Safety Systems. 2.3.1 Step 1: Identify Failure Scenarios. 2.3.2 Step 2: Estimate the Consequences. 2.3.3 Step 3: Determine Tolerability of Consequences. 2.3.4 Step 4: Estimate Likelihood and Risk. 2.3.5 Step 5: Determine Tolerability of Risk. 2.3.6 Step 6: Consider Enhanced and/or Alternative Design. 2.3.7 Step 7: Evaluate Enhancements and/or Alternatives. 2.3.8 Step 8: Determine Tolerability of Risk and Cost. 2.3.9 Step 9: Document Results. 2.4 Guidelines for Risk Tolerability. 2.5 Potential Process Safety Systems Design Solutions. 2.5.1 Four Categories of Design Solutions. 2.5.2 Characteristics of Design Solutions Categories. 2.6 Applying the Risk–Based Design Bases Selection Technique. 2.6.1 Locking Open a Valve (a Simple Design Case). 2.6.2 Selecting the Relief System Basis for a Reactor (a Complete Design Case). 3.2.1 Storage Tank Autopolymerization Incident. 3.2.2 Storage Tank Stratification Incident. 3.2.3 Batch Pharmaceutical Reactor Accident. 3.3 Failure Scenarios and Design Solutions. 3.4.1 Use of Potential Design Solutions Table. Table 3. Failure Scenarios for Vessels. 4.2.3 Continuous Sulfonation Reaction Explosion. 4.3 Failure Scenarios and Design Solutions. 4.4.1 Use of Potential Design Solutions Table. Table 4. Failure Scenarios for Reactors. 5.2.1 Distillation Column Critical Concentration. 5.2.2 Ethylene Purifier Vessel Rupture. 5.2.3 Ignition of Pyrophoric Materials in Gasoline Fractionator. 5.3 Failure Scenarios and Design Solutions. 5.4.1 Use of Potential Design Solutions Table. Table 5. Failure Scenarios for Mass Transfer Equipment. 6.2.1 Ethylene Oxide Redistillation Column Explosion. 6.2.2 Brittle Fracture of Heat Exchanger. 6.3 Failure Scenarios and Design Solutions. 6.4.1 Use of Potential Design Solutions Table. Table 6. Failure Scenarios for Heat Transfer Equipment. 7.2.1 Drying a Compound Fertilizers. 7.2.2 Fires In Cellulose Acetate Dryer. 7.2.3 Pharmaceutical Powder Dryer Fire and Explosion. 7.3 Failure Scenarios and Design Solutions. 7.4.1 Use of Potential Design Solutions Table. Table 7 Failure Scenarios for Dryers. 8.2.3 Compressor Fire and Explosion. 8.2.4 Start–up of Parallel Centrifugal Pumps. 8.3 Failure Scenarios and Design Solutions. 8.4.1 Use of Potential Design Solutions Table. Table 8. Failure Scenarios for Fluid Transfer Equipment. 9.3 Failure Scenarios and Design Solutions. 9.4.1 Use of Potential Design Solutions Table. Table 9. Failure Scenarios for Solid–Fluid Separators. 10. Solids Handling and Processing Equipment. 10.2.1 Silicon Grinders Fire and Explosion. 10.2.2 Blowing Agent Blender Operation Explosion Incident. 10.3 Failure Scenarios and Design Solutions. 10.4.1 Use of Potential Design Solution Table. Table 10. Failure Scenarios for Solids Handling and Processing Equipment. 11.2.2 Ethylene Cracking Furnace Overfiring. 11.3 Failure Scenarios and Design Solutions. 11.4.1 Use of Potential Design Solutions Table. Table 11. Failure Scenarios for Fired Equipment. 12. Piping and Piping Components. 12.2.1 Fixborough Expansion Joint Failure. 12.2.2 Chemical Storage Terminal Fire. 12.3 Failure Scenarios and Design Solutions. 12.4.1 Use of Potential Design Solutions Table. Table 12. Failure Scenario for Piping and Piping Components. Appendix A. Example Problem: Batch Chemical Reactor. Appendix B. Example Problem: Distillation System.